Pediatric nurses nowadays serves a variety of roles, from teaching in various setting to rendering hands-on care in hospitals or clinic. Taking care of children involves self-awareness that one must be patient enough about kids as well as consider the fundamentals of child psychology especially the developmental stages. Since children could not sometimes utter what they really felt whenever they are sick, careful assessment and an experienced “clinical eye” must be employed. It may sound too complex, but beyond the grimaces and cries of children comes their angelic faces smiling at you when you will be able to talk their language. Their parents and caregivers are the next people who must be well taken cared of in terms of proper health teaching since they will be the primary caregivers once children will return to thier community. A. Family Advocate – Nurses are expected to be sensible enough in voicing out the needs of their patients and folks in behalf of them when it is impossible for them to readily address their needs. B. Health Promoter – Nurses prefer measures to prevent diseases rather than waiting for it to be complicated. They are the ones responsible enough to guide the parents to promote proper nutrition, updated immunizations, and early detection of health problems. It is their primary responsibility to ensure the normal growth and development of children so that they can perform daily activities to its optimum level. C. Health teacher – Health teaching is very basic for nurses since they are the ones responsible for monitoring the patients as well as carry out the physician’s discharge orders. It is then a must to anticipate parents to ask for ways to improve their children’s health such as parenting and disease process so as to prevent future hospital admission as much as possible. D. Counselor – Nurses must be active listeners in order to establish a therapeutic relationship between parents and the child, making health care plans easier. E. Researcher- Change is constant in the health care setting, so it is a must to practice evidenced-based practice. 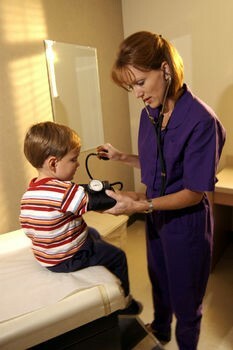 This means that pediatric nurses should have the ability to improve themselves in order to give updated care. F. Coordinator / Collaborator – Pediatric nurses are sometimes or most of the member of the health team, so he or she might be in a position wherein he or she is the avenue of important information that other health team members need in delivering competent care. So it is a must that pediatric nurses need to be a good information giver and communicator among health team members to promote a harmonious working environment. There are many roles that a pediatric nurse could perform as health care settings evolved from one stage to another. The challenge lies behind the application of evidenced-based practice to provide competent care to children. Last but not the least, having a heart for children matters a lot when the work load at the area seems to be heavy – children could make you smile no matter how harsh the world could be.